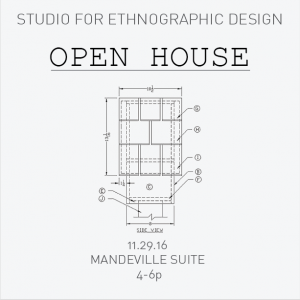 The Studio for Ethnographic Design presents playwright Paul Flores and gang peacemaker Alex Sanchez. 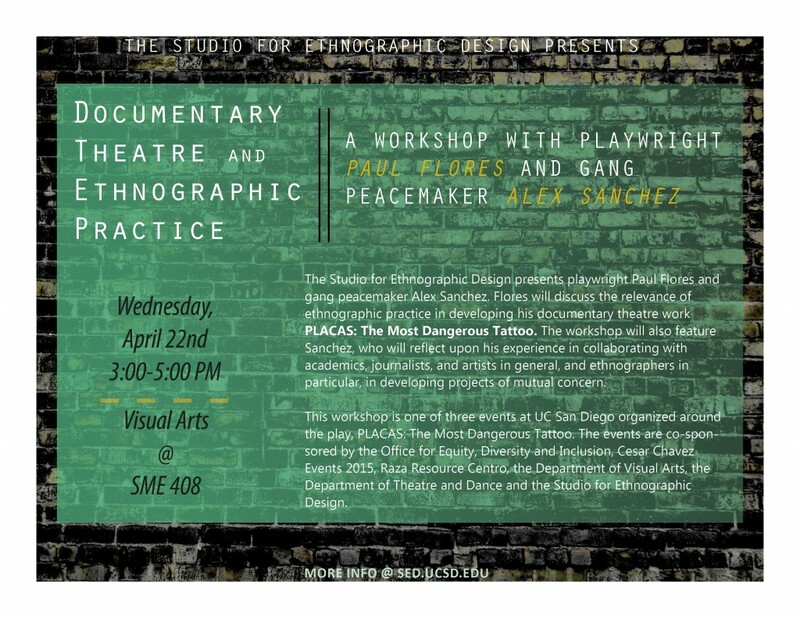 Flores will discuss the relevance of ethnographic practice in developing his documentary theatre work PLACAS: The Most Dangerous Tattoo. The workshop will also feature Sanchez, who will reflect upon his experience in collaborating with academics, journalists, and artists in general, and ethnographers in particular, in developing projects of mutual concern. Workshop participants will discuss the intersections between ethnography and theatre as sites for collaboration and social transformation. Using PLACAS as an example, participants will engage with ethnographic research techniques geared towards building documentary theatre. This entry was posted in Events and tagged documentary, performance, theatre on April 21, 2015 by caushana. Join SED for a three-day series of events celebrating Latino cultural production, ethical research practice, and ethnographic design in anticipation of the theatre production PLACAS: The Most Dangerous Tattoo. The play follows the life of a Salvadorean ex-gang member and his journey to remove his tattoos, save his son, and explore his identity. 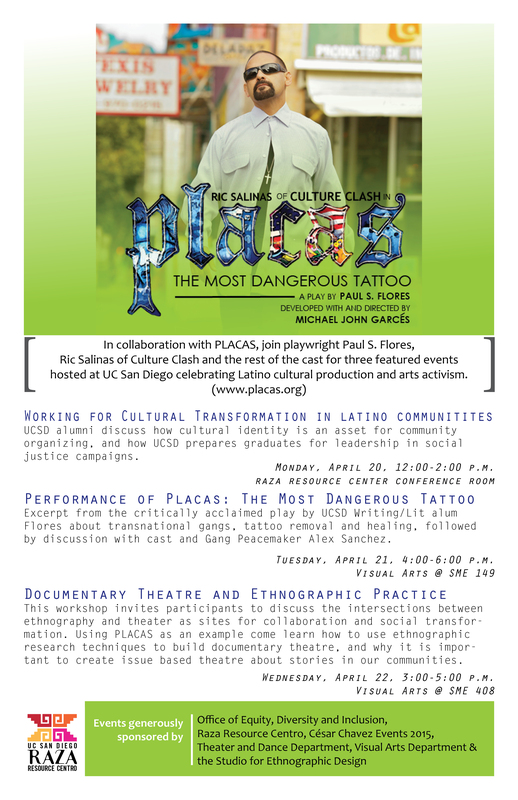 Written by Paul Flores (UCSD alum) and directed by Michael John Garces (Cornerstone Theatre), PLACAS is based on the life of activist and founder of Homies Unidos, Alex Sanchez, who is played by Ric Salinas of Culture Clash. The play will be performed at Lincoln High School in National City, April 23-25. Playwright Flores, activist Sanchez, and the rest of the cast will be engaged in multiple events at UC San Diego to discuss documentary practices and social justice issues. 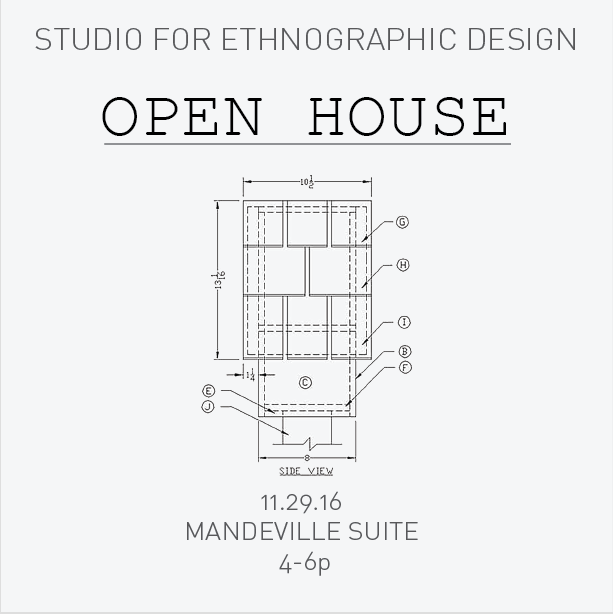 The Studio for Ethnographic Design presents playwright Paul Flores and activist Alex Sanchez. Flores will discuss the relevance of ethnographic practice in developing his documentary theatre work PLACAS: The Most Dangerous Tattoo. The workshop will also feature gang peacemaker Alex Sanchez, who will reflect upon his experience in collaborating with academics, journalists, and artists in general, and ethnographers in particular, in developing projects of mutual concern. This entry was posted in Events and tagged activism, documentary, ethnography, performance, theatre on April 16, 2015 by caushana. 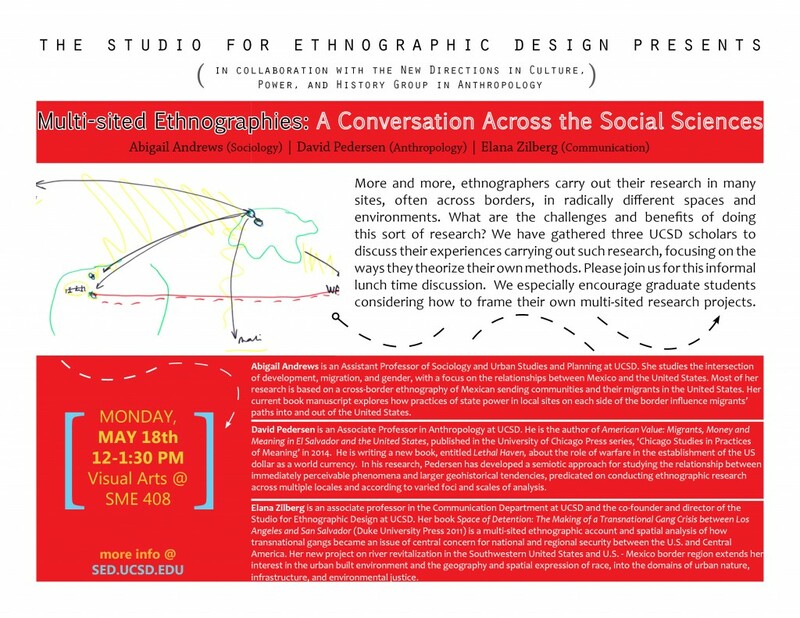 Join SED for a discussion on ethnography and disability co-hosted with the Center for Humanities Research Group Translat(e)ability: Borders, Disability, and Crip Collaboratives. 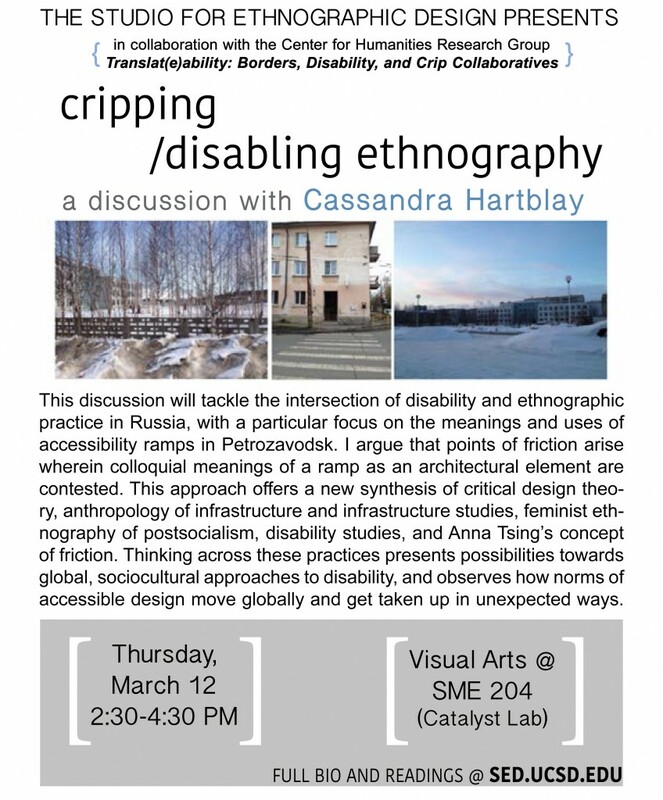 Cassandra Hartblay – a PhD Candidate in the Department of Anthropology at the University of North Carolina at Chapel Hill – will present work on the tensions and possibilities of producing ethnographic work in relation to critical disability studies. Cassandra Hartblay is an award-winning scholar of disability and postsoviet Russia. An ethnographer and cultural anthropologist by training, her work contributes to interdisciplinary conversations in queer/feminist disability studies, global studies, and infrastructure studies. Cassandra’s work on comparative regimes of productivity and dependency, as related to gender, disability, and the welfare state between the United States and Soviet Union in the 20th century, received the competitive Irving K. Zola Award for Emerging Scholars in Disability Studies in 2013. She has also worked as an applied qualitative researcher with the Soros Foundation, contributing to a collected volume on inclusive education in Central Asia. She is a dedicated ethnographer devoted to community engagement, critical praxis, social change, and fostering cross-cultural understanding. Hartblay, C. (2015). “It’s just for the check mark”: Minimum Requirements, Global Friction, and Inaccessible Accessibility Ramps in Russia. Work in Progress. This entry was posted in Events and tagged disability, ethnography on March 10, 2015 by caushana. This is a discussion-style event – please feel welcome to attend even if you do not have time for the readings. 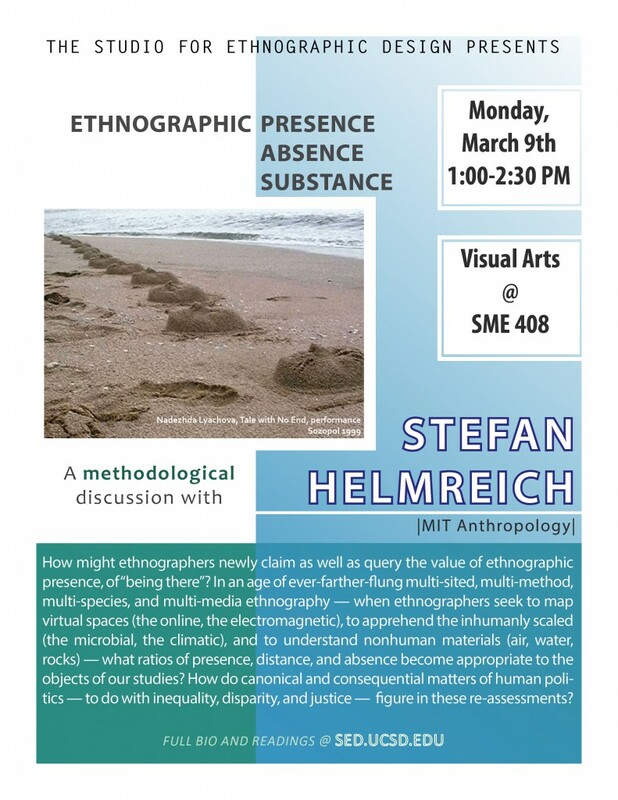 This entry was posted in Events and tagged absence, ethnographic presence, methodology on March 2, 2015 by kdewolff. 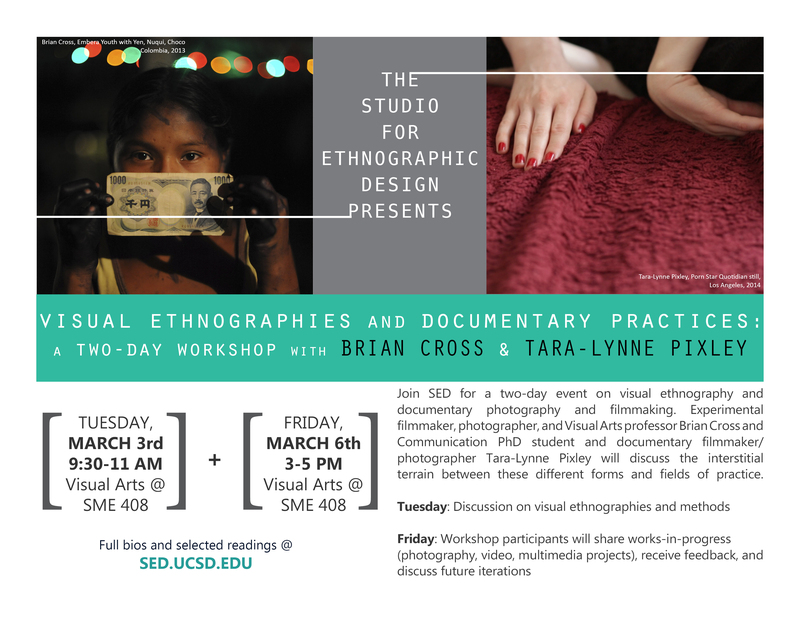 Join SED for breakfast and a vibrant discussion on visual ethnographies and documentary practices led by Visual Arts professor Brian Cross (B+) and Communication PhD student Tara-Lynne Pixley. Cross and Pixley — both photographers and filmmakers — will discuss the interstitial terrain between these different forms and fields of practice. Part II of this workshop is structured as a collaborative event where participants are encouraged to share works-in-progress (photography, video, and multimedia projects), receive feedback, and discuss future iterations of these visual and experimental projects. Connole, B. (n.d.). Sub-altermodern art? An interview with B+. MacDougall, D. (1978). Ethnographic Film: Failure and Promise. 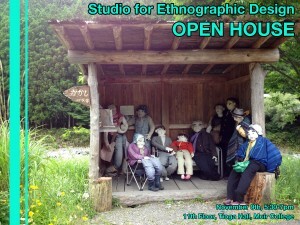 Annual Review of Anthropology, 7, 405-425. Minh-Ha, T. (1990). Documentary Is/Not a Name. October, 52 (Spring), 76-98. This entry was posted in Events on February 27, 2015 by caushana. Drawing from community-based research with youth and families, Angela Booker will trace the complexities of negotiating textures of agency and calls to action that permeate both ethnographic and design-based work. When challenges to existing discourses of power are added, ethical quandaries and opportunities emerge. 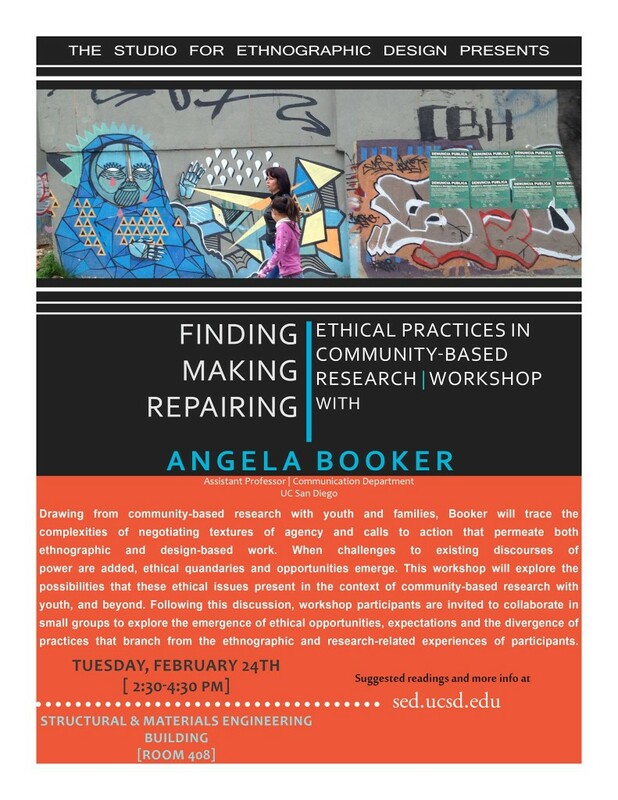 This workshop will explore the possibilities that these ethical issues present in the context of community-based research with youth, and beyond. Following this discussion, workshop participants are invited to collaborate in small groups to explore the emergence of ethical opportunities, expectations and the divergence of practices that branch from the ethnographic and research-related experiences of participants. Goldman, S., Booker, A., & McDermott, M. (2008). Mixing the Digital, Social, and Cultural: Learning, Identity, and Agency in Youth Participation. In Youth, Identity, and Digital Media (p. 185–206). Cambridge, MA: The MIT Press. This entry was posted in Events on February 23, 2015 by caushana.